The Human Library brings together the Lehman College Community to enhance experiences of diversity and inclusion. Students share their own stories of inspiration and resilience to break down barriers of stigma, bias, and misunderstanding. The Human Library®, http://humanlibrary.org/, is a concept and worldwide movement for social change developed by Ronni Abergel, Dany Abergel, and colleagues Asma Mouna and Christoffer Erichsen, which began in Denmark in 2000. It is a library of human beings, each representing a group in the community exposed to stigma or discrimination. It is designed to build a positive framework for conversations that can challenge stereotypes and prejudices through dialogue. The Human Library®, is a place where real people are on loan to readers and where difficult questions are expected, appreciated and answered. The Human Library®, encourages patrons to become Readers, by metaphorically “checking out” a Human Book for a 30-minute loan – formulating a conversation where patrons can ask questions they normally would not feel comfortable posing, and where Human Books can respond with their unique experiences. Lehman College and Leonard Lief Library provide a safe space for dialogue on challenging topics to enhance diversity, equity, and inclusion. 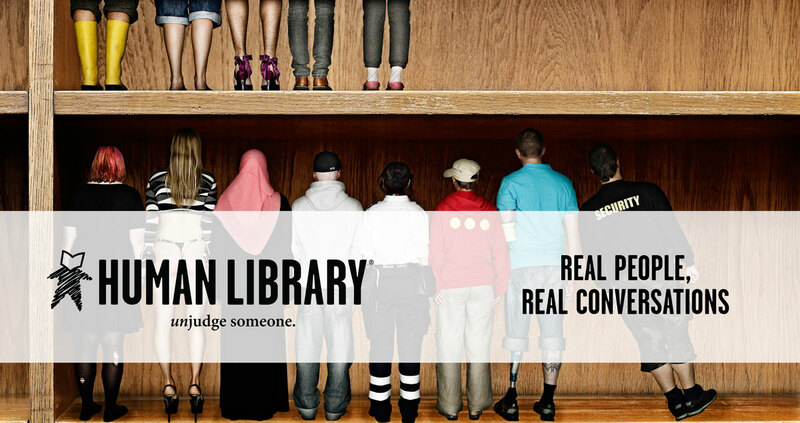 The Human Library® provides a platform and gives voice to individuals to break down assumptions, and bias. The Lehman community benefits from engaging conversations with Human Books, which can shape new understandings and perceptions. Human Books volunteer to challenge and break down barriers through honest and respectful dialogue. Their stories represent a range of backgrounds and life experiences. Lehman College students, faculty, and staff may volunteer as Books. Human Books have the right to tell their story and the right to privacy. Readers have the right to ask questions. Both have the right to be treated respectfully. The Human Library® provides fresh perspectives, raises awareness of issues, and honors diversity. Human Books help build understanding through conversation and engagement. They are agents of change and inspire others with their true stories of resilience. Human Books receive a Letter of Participation from the Human Library® Coordinator. They also earn a Human Library® Digital Badge from Lehman College, https://lehman.credly.com/view-credit/137870. To receive the badge, Human Books discuss their unique story on a challenging topic, answer difficult questions from readers who “check them out, help shape a new understanding of people’s differences, and honor diversity within the Lehman College community. You can register to be a Human Book once an announcement is made via the Lehman College listserv or when you see flyers on campus inviting volunteers to register at http://libguides.lehman.edu/human-library. Registrants provide their email, book title and short book summary. Book titles and summaries are your own. It can include topics on coping with illness, loss, grief, college life or a disability, discussing your identity, culture, religion, family, language, and experiences with stigma or prejudice. The Human Library® coordinator at Lehman College will contact and set up a consultation with registrants to describe the process of being a book. Students, faculty and staff are welcome to be Readers at the Human Library®. Readers have the right to ask questions, the right to privacy, and be treated respectfully. Please respect the privacy of all Human Books. If you decide to write about the Human Library® at Lehman College after a conversation, please refrain from using any personal names or specific places discussed during this interactive experience. Detailed information available on http://libguides.lehman.edu/human-library. Contact: Rebecca Arzola, Rebecca.Arzola@lehman.cuny.edu, 718-960-8861. What Exactly is the Human Library®?